Kuntal Ganguly, "R Data Analysis Cookbook - Second Edition"
This book is for data scientists, analysts and even enthusiasts who want to learn and implement the various data analysis techniques using R in a practical way. Those looking for quick, handy solutions to common tasks and challenges in data analysis will find this book to be very useful. Basic knowledge of statistics and R programming is assumed. This book will show you how you can put your data analysis skills in R to practical use, with recipes catering to the basic as well as advanced data analysis tasks. Right from acquiring your data and preparing it for analysis to the more complex data analysis techniques, the book will show you how you can implement each technique in the best possible manner. You will also visualize your data using the popular R packages like ggplot2 and gain hidden insights from it. Starting with implementing the basic data analysis concepts like handling your data to creating basic plots, you will master the more advanced data analysis techniques like performing cluster analysis, and generating effective analysis reports and visualizations. Throughout the book, you will get to know the common problems and obstacles you might encounter while implementing each of the data analysis techniques in R, with ways to overcoming them in the easiest possible way. 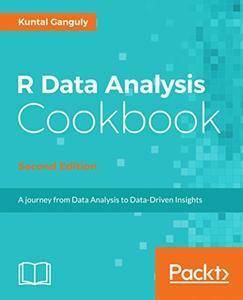 By the end of this book, you will have all the knowledge you need to become an expert in data analysis with R, and put your skills to test in real-world scenarios. Your one-stop solution for common and not-so-common pain points while performing real-world problems to execute a series of tasks.